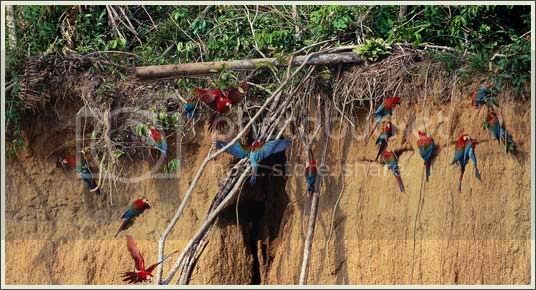 In the early morning hours, as the sun is rising and weather permitting, wild parrots all over the world visit clay licks on tall riverbanks to eat dirt. This practice has long confounded bird watchers, conservationists and scientists alike, and while all of the benefits of this activity are still a mystery, more and more is being discovered and understood. 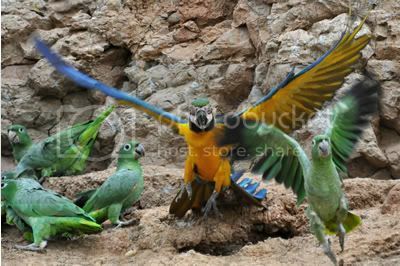 Wild parrots forage on plants, their fruits and their seeds as part of their natural diet. However, plants naturally produce chemicals, poisons, that protect themselves, their unripened fruits and seeds from violators. As parrots consume these plants, they can become laden with toxins that can overwhelm their system and interfere with nutrient and mineral absorption. They get tummy aches. Their diet is less complete. Enter the clay lick. Not only are the cliffs at the riverbank rich with the minerals that are missing from the parrot’s natural diet, but the clay content in the soil contains some of the same ingredients found in our over-the-counter stomach and digestion ailment products. Clay coats the intestinal tract and binds to the toxins that have been eaten and passes them through the digestive system so that they are not able to be absorbed into the blood stream. There are still many questions about the clay licks that go unanswered: for instance, it’s unknown how often a single parrot visits his local clay lick. It isn’t understood why that, while parrots benefit from a high clay content in riverbank soil, they don’t also ingest other soils that have been tested and shown to have a higher nutritional content. There certainly isn’t enough knowledge about this behavior for us to be adding clay to OUR parrot’s diets, although some products now include clay in their list of ingredients. We simply don’t know how much is being safely consumed in the wild. It makes me wonder what other resources wild parrots and animals are using for medicinal purposes and health benefits that we don’t yet know about. We owe a huge debt to these pioneers who have taught the human race so much. 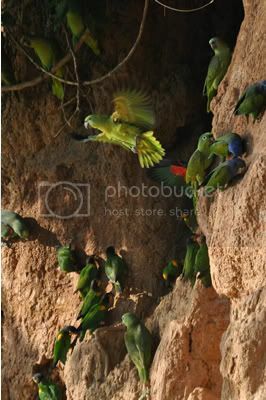 Field researchers logged in about 1,000 parrots visiting the clay lick in Tambopata, Peru early one morning. Can you imagine the noise? Most people seem to associate the macaw with clay licks, but, in actuality, there are many species that benefits from them. Parakeets, amazons, pionus, caiques, african greys, conures, lorikeets and parrotlets are some of the others parrot species that frequent the clay licks as well as many mammals. Clay licks have become a huge attraction for Eco-tourists. There are many Eco-tours that make the clay licks a focal point in the tour and lodges have been built locally to house the tourists. This brings a lot of money into the local economy and helps to support the conservation efforts for these magnificent parrots.